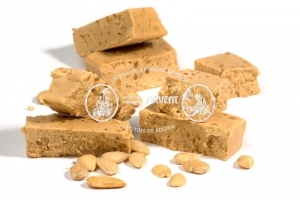 We want everyone to eat and enjoy the delicacy which are the Jijona nougat, often will find the recipe for a mousse tart with nougat Jijona . 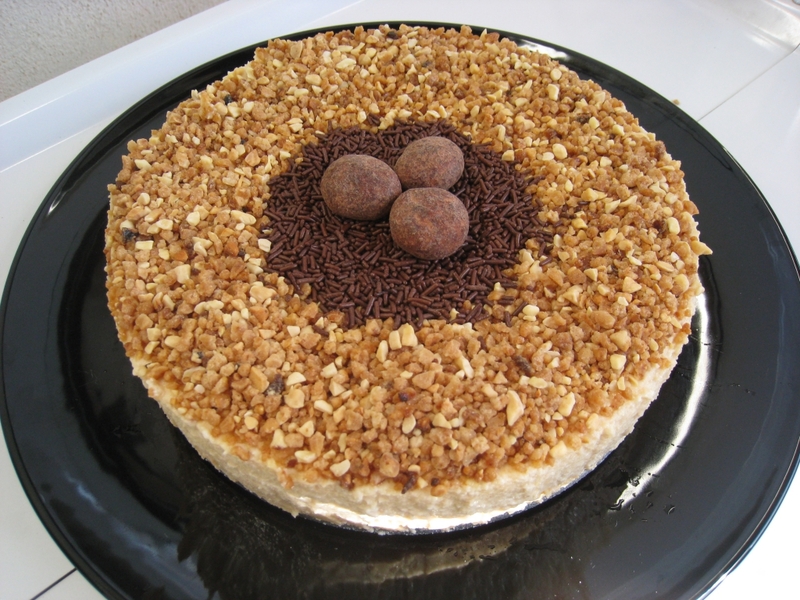 That’s why if you want to learn how to make your own mousse tart with nougat Jijona one you should read the following recipe … and of course you have to try to make this mousse nougat cake in your home. 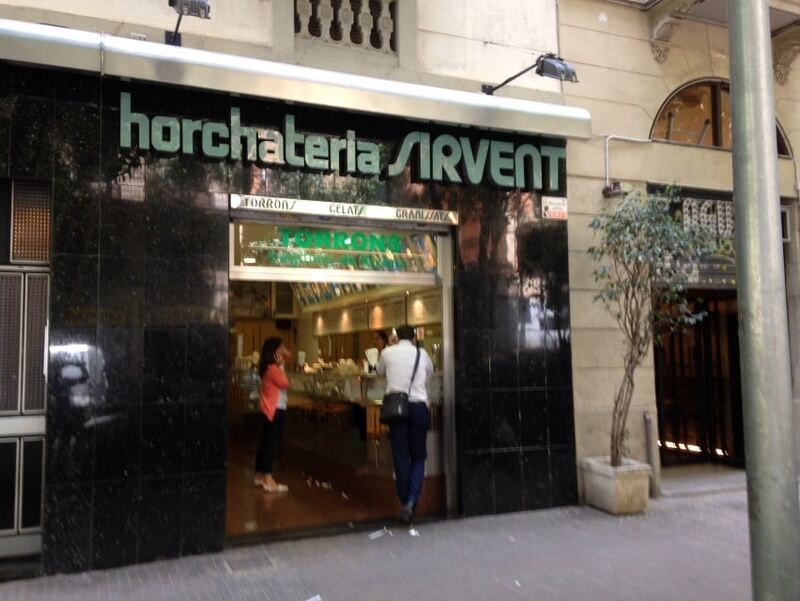 With this post we continue with recipe recipes publications Horchateria Sirvent de Barcelona; the above were: How to make soft nougat cake and As make nougat cake diabetic ; and today published the recipe for a cake mousse nougat Jijona, a very special while rich recipe. 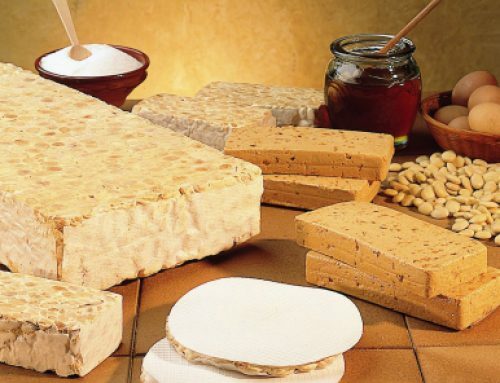 Before starting to cook the nougat mousse cake, saying that if you are very fond of this mousse nougat nougat cake’re going to enjoy it immensely. 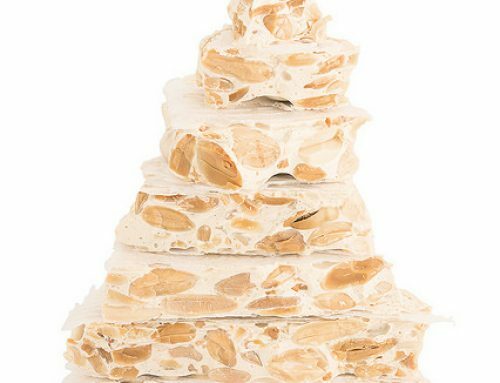 This nougat cake is simple and easy to do at the same time is very rich, but like everything in life, or almost all, the second time always comes out better, practice is what you have, but we assure you that is not difficult, a little time and patience … and you will have your list mousse cake nougat Jijona. 150ml. whipping creamWith all these ingredients we can make a spectacular and delicious cake nougat.The first thing we do, is the basis for our mousse cake nougat Jijona , for it, you know it is very easy, as in the other bases of the recipes we take cookies Maria, and the grind or crush simply placing them between two sheets of plastic wrap and followed, passed over the rolling pin several times, remain finely crushed.Then we melt the 50g. butter in the microwave and mix with crumbs of crushed cookies into a paste.Once we have the well compacted pasta, we will have a circular mold, we will put on a tray or directly onto the plate where we go to serve the mousse cake nougat Jijona, you place it in the shape of the mold a strip of acetate paper, to make it easier then unmold the mousse cake. Introduce the biscuit base at the bottom, pressing well with a spoon or some other utensil is us as level as possible. And finally we keep the pan in the refrigerator so that the biscuit base settles. First we put the gelatin sheets in cold water for a while to hydrate. 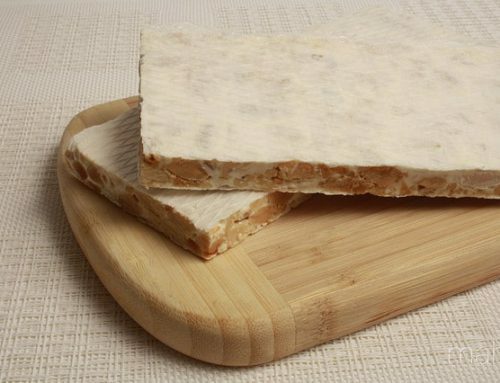 Grate or chop jijona nougat. 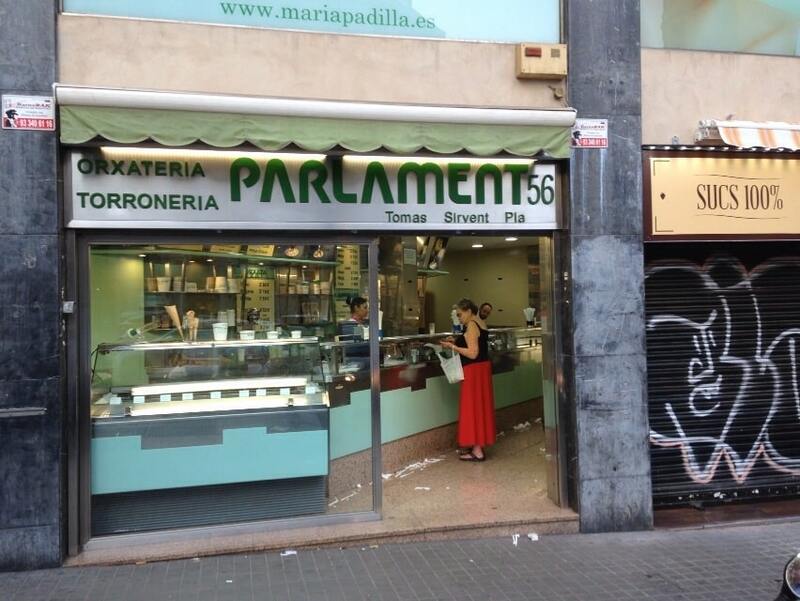 If you trituráis with the blender, do not come over, because with the heat of grinding, nougat become a paste. In a bowl firmly we assemble 150ml. whipping cream; and secondly we assemble the two egg whites until stiff. We reserve also. With that part done, in another saucepan heat up the 50ml. 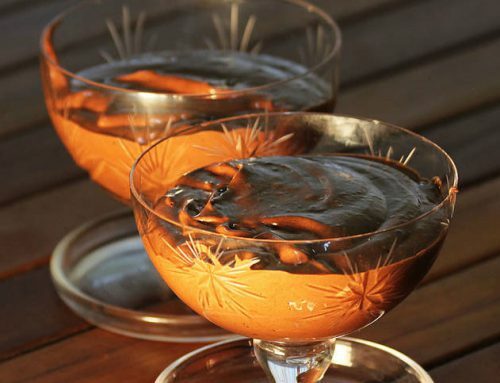 double cream (whipping cream), remove from the heat, drain them gelatin and add it to the hot cream. Stir vigorously with a spatula until gelatin is completely dissolved. And at the end had the mixture into a clean bowl. 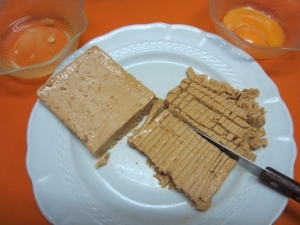 Then add the two egg yolks, the mix well, then add the turrón Jijona completely shredded. Stir so that all ingredients are blended and left us a fine smooth paste. We incorporate the whipped cream with envelopes so you do not get off moves, and then add the clear mounted, and mix in the same way. Fill the mold with the mousse, pouring it over the biscuit base we have developed earlier and we had left in the fridge. We tapped to settle it, and store in the freezer about 4-5 hours or until frozen. We removed the mousse cake nougat Jijona from the freezer, let stand a few minutes so that the mousse was a bit off the acetate. Carefully removed the hoop and then the acetate, which we decorate with reserved crumb nougat part, cherries or chocolate truffles or to taste Cook / a.